One of the Vadakkunnathan Temple Indian elephants (Elephas maximus indicus). The elephants are an integral part of the Hindu festivals, and most famously, the colourful Thrissur Aanayoottu (feeding of elephants) Festival in Kerala. 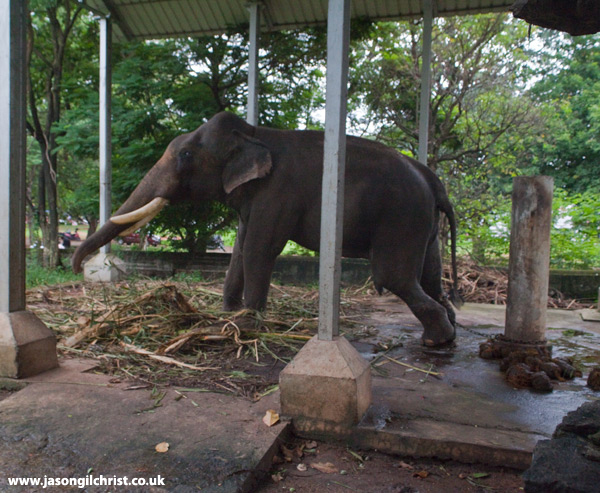 This was one of a number of elephants that were chained with almost no slack within the temple grounds. The welfare of temple elephants is thankfully gaining attention nationally and internationally, notably in the documentary "Gods in Shackles" (http://www.godsinshackles.com/). The 'God' reference relates to elephants as the embobiment of the Hindu god Lord Ganesh (or Ganapati), the elephant-headed god. Vadakkunnathan Temple, Thrissur, Kerala, India.